This transceiver is out of production since 2005. TRX2/4S is intended for use outside the Eupean Community (EU) only. Shipment only to addresses outside of EU. Special applications (military, research) upon request. We are proud to indroduce our new 430 MHz data transceiver TRX4S. variable frequency, 10 programmable frequecies selectable with a switch. programmed and stored for every channel in eeprom via rs232 interface. the reading is individually calibrated and stored in eeprom for every transceiver. tx->rx: 10 µs; rx->tx(wide): 50 µs; rx->tx(narrow): 200 µs. qualities (symmetric diode mixers), dynamic range -120 dBm to -40 dBm. minimal spurious emissions (harmonic and nonharmonic products) under -60 dBc. minimal interference to adjacent channels, even while tx/rx switching. wide-modus (audio: 100Hz to 100 kHz bandwidth) for 76800 and 153600 Baud FSK . very stable frequency (within 2 kHz over temperature). 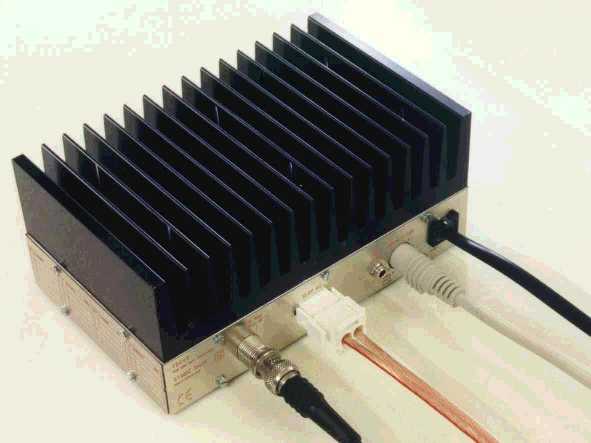 cooler temperature can be read-out vie rs232 in Celsius or Fahrenheit (calibrated). overtemperature protecttion of power amplifier (switches off at 65 C). Standard FM radios are not suited for high speed data communication with amateur radio. much too slow TX/RX delay time (typ. 50 bis 250 ms). IF filter group delay is not flat over frequency (poor phase response). RX signals get distorted. IF bandwidth is too narrow. This limits the data rate to 9600 baud FSK maximum. interference on adjacent channels with frequent T/R switching. TX/RS switching delay less than 1 ms for duplex AND simplex mode. Modulator response 5 Hz to 10 kHz (9600 baud) or 75 kHz for 153600 baud without phase distortions. IF-filter bandwidth 30 kHz with flat group delay (for 19200 baud). IF-filter bandwidth 250 kHz with flat group delay (for 153600 baud). T/R switching without interference on adjacent channels (click / chirp). Sufficient output power (>20 Watt) possible to reduce, continuous transmit allowed. 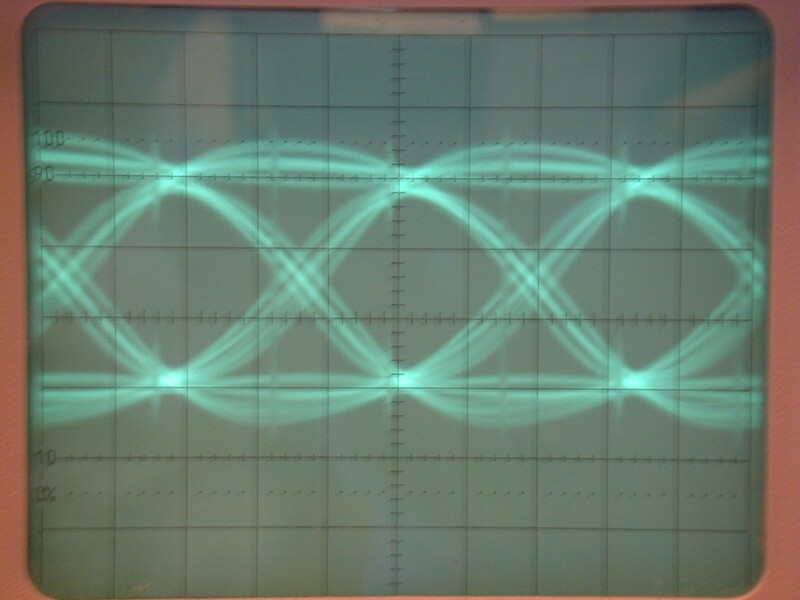 Frequency programmable in 12.5 kHz steps. With the TRX4S, we have developed a data transceiver without compromises, which allows transmission and reception of signals with up to 153 kBit/s data rate without limitations. The time needed to transmit a single byte with 9600 baud needs approx. 0,8 ms. A normal transceiver has a delay (from PTT to transmit) of typically 100 ms. With the TRX4S, this time is enough to transmit a complete data packet (100 byte). 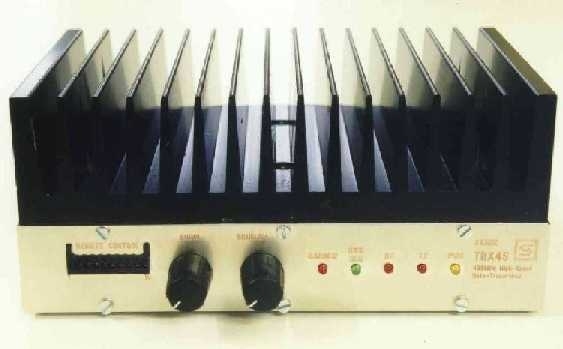 Using higher data rates (153 Kbaud), the packet-length is 5 ms only, hence the TX-delay should be less than 0,5 ms.
TRX4S / TRX2S are suited for amateur radio, but the rugged design and the excellent large-signal quality makes the transceivers suited for continuous operation (digipeater use), commercial or space applications as well. Thouhh designed primarly for data communication, the TRX4S max be used for FM (audio) applications as well. The bandwidth makes the TRX4S also suited for high quality audio-applications hi-fidelity or special audio measurement). The printed circuit board and the power module is mounted on a thick 5mm aluminium base (100 x 160 mm). Around the base there is a 30 mm precision frame and a second aluminium cover with the speaker and display makes the TRX a brick-like very compact and small size transceiver. The base with the power module is cooled by a big cooler good for 50% transmit to receive ratio. 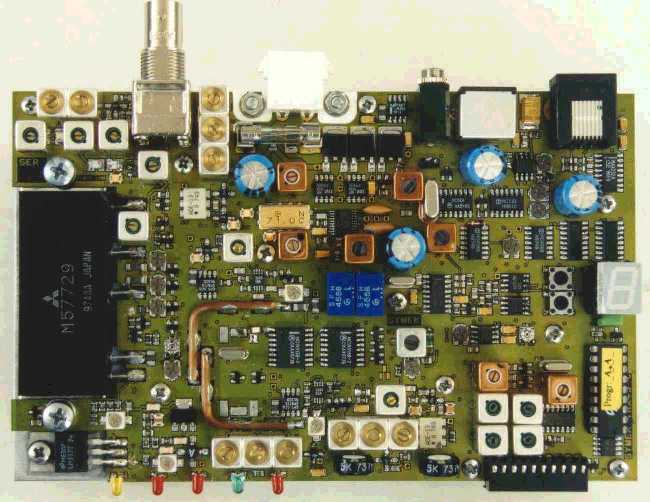 circuit board of TRX4S, click to magnify. s-meter calibrated in dBm and read-out via RS232. slow keying of rf power in narrow mode to avoid adjacent channel interference (clicks). 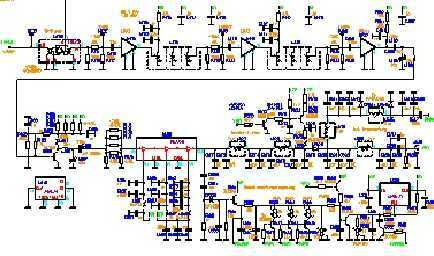 This is how the eye diagram at the data output of TRX4S looks like. TRX4S is available for 2m band 144-146 MHz (TRX2S). Other custom frequencies (100 to 560 MHz) upon request. Any more questions? Call us or write an e-mail!